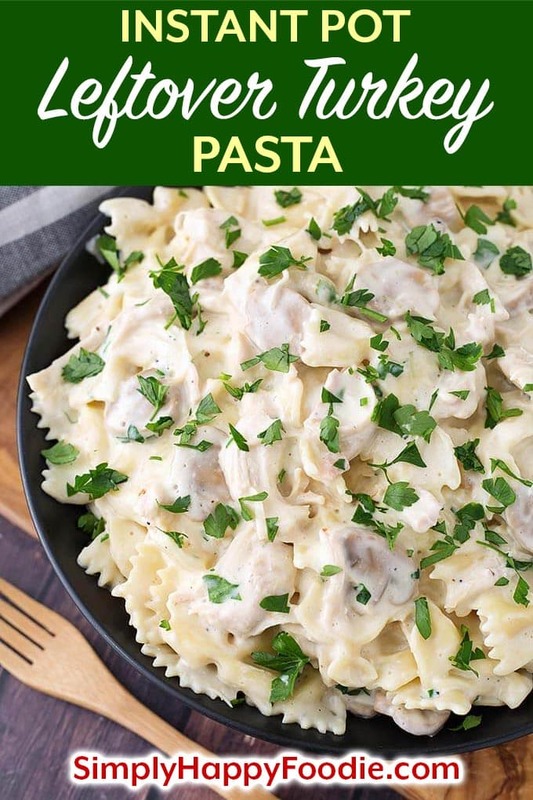 Instant Pot Leftover Turkey Pasta is a creamy, delicious one-pot meal that uses leftover turkey meat or chicken. This is a “dump and start” pressure cooker pasta recipe. It doesn’t get much easier than this tasty dish! I have been asked to make some recipes that use up leftover turkey meat. This is one I came up with when a different plan fell through and I had to whip up a meal for company. They loved it! So, in the spirit of planning ahead to the ‘after Thanksgiving’ meals, I’m sharing my recipe for Instant Pot Leftover Turkey Pasta with you! 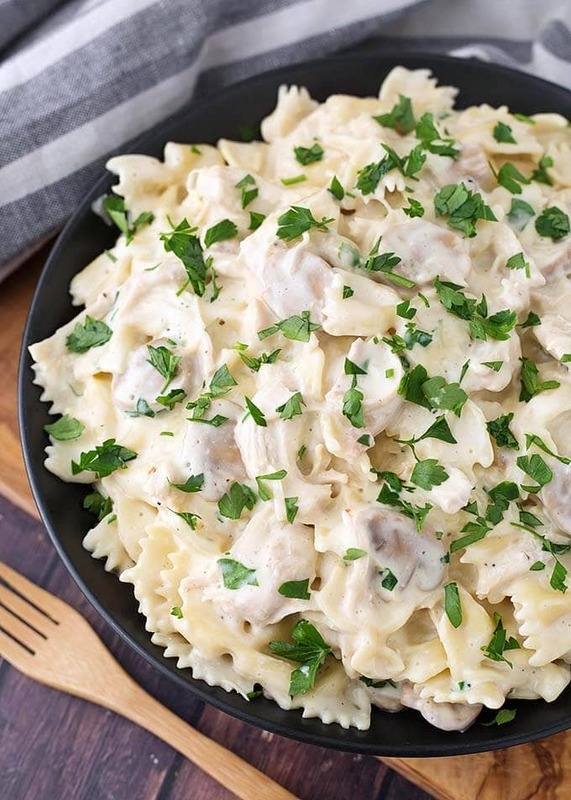 This is a creamy pasta dish, and works well with the turkey. 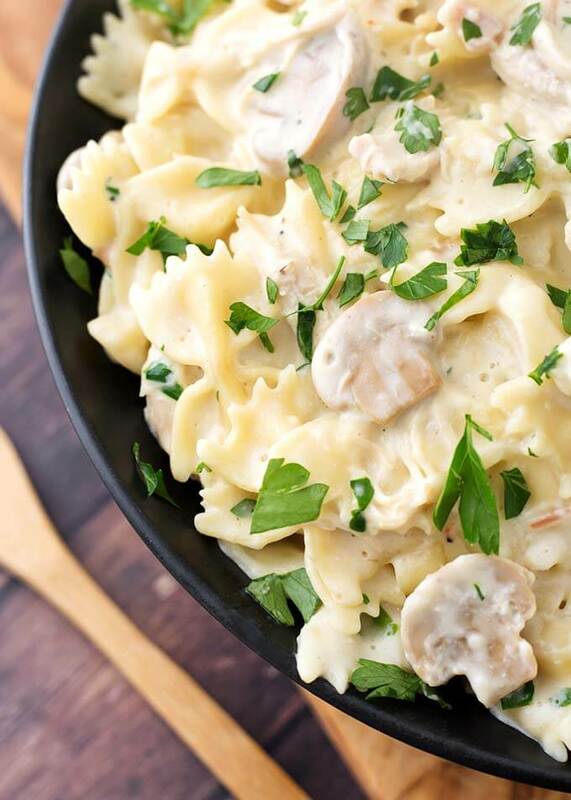 The farfalle, or bow tie, pasta is a great choice for this recipe because it is hearty and light at the same time. If you don’t have leftover turkey, a shredded rotisserie chicken would also be really good in this recipe. I like using those chickens in all kinds of recipes! Talk about easy! A word about the seasoning in this recipe. Try to get the Zesty Italian salad dressing mix. It’s zestier, lol! If all you can find is the regular kind, it will still taste good. If you want to shave off a few calories, use low fat cream cheese, reduced fat soup, and half and half. Then you can eat another piece of that leftover pie! 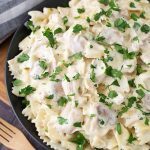 Instant Pot Leftover Turkey Pasta is a creamy, delicious one-pot meal that uses leftover turkey meat or chicken. This is a "dump and start" pressure cooker pasta recipe. Pour the broth into the inner liner pot of your pressure cooker. Add the cream cheese pieces and mushrooms. Sprinkle in the Italian dressing mix. Pour in the bow tie pasta and spread it out evenly, but don't stir it. Pour the cream over the pasta, then spread the cream of chicken soup over the pasta. Do not stir. Press the Pressure Cook/Manual button or dial and then the +/- button and select 5 minutes (if you use a different pasta, try half the time on the package directions). The pot will take a few minutes to get to pressure. When the pin in the lid drops down, open the lid and stir the pasta. Add the leftover turkey meat and stir until the cream cheese and turkey meat is well incorporated. Then let sit for a few minutes for the turkey to warm through and the sauce to thicken. Serve with a garnish of chopped fresh parsley. The directions don’t say when to add the heavy cream….is it added before pressure cooking or after? Thank You!